(Abu Dhabi) – His Highness Sheikh Mohamed bin Zayed Al Nahyan, Crown Prince of Abu Dhabi and Deputy Supreme Commander of the UAE Armed Forces, witnessed the signing of two new strategic equity partnerships between the Abu Dhabi National Oil Company (ADNOC), Eni and OMV covering both ADNOC Refining and a new trading joint venture, which will be jointly established by the three partners. The signing of the agreements were also witnessed by Giuseppe Conte, Prime Minister of Italy, and Hartwig L?ger, Austria’s Federal Minister of Finance. 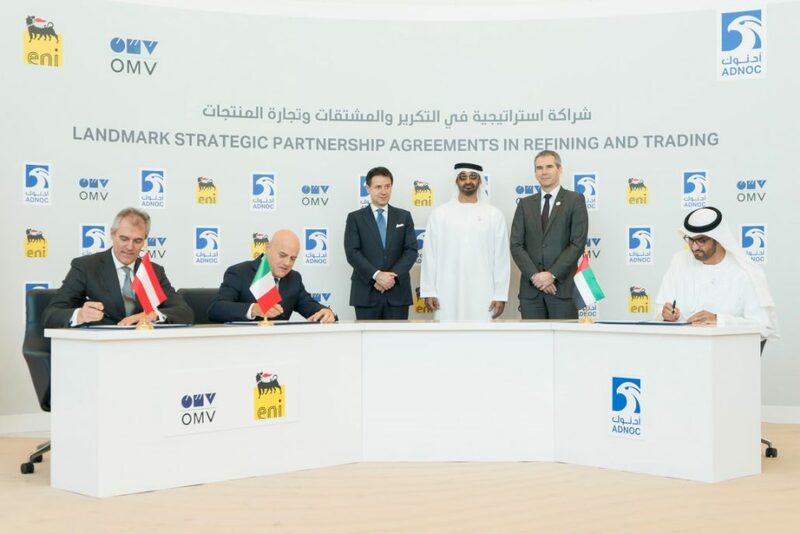 The agreements were signed by Dr. Sultan bin Ahmad Sultan Al Jaber, Minister of State and ADNOC Group CEO, Claudio Descalzi, CEO of Eni and Dr. Rainer Seele, Chairman of the OMV Executive Board and CEO. In one of the largest ever refinery transactions, Eni and OMV will acquire 20 percent and 15 percent shares in ADNOC Refining respectively, with ADNOC owning the remaining 65 percent. The agreement values ADNOC Refining, which has a total refining capacity of 922,000 barrels per day, and which operates the fourth largest single site refinery in the world, at an enterprise value of $19.3 billion. As a further part and condition of this agreement, the partners will also establish a trading joint venture, in which Eni and OMV will own 20 percent and 15 percent of the shares respectively. Proceeds to ADNOC from the sale are estimated to be US$5.8 billion, subject to completion adjustments. The transaction reflects the scale, quality and growth potential of ADNOC Refining’s assets, coupled with an advantageous location from which to supply markets in Africa, Asia and Europe. Eni and OMV have strong track records in maximising value from advanced, complex refinery operations and bring to the partnership extensive operational and project management experience and expertise. Further value will be created from the new global trading joint venture, which, once established, will be an international exporter of ADNOC Refining’s products, with export volumes equivalent to approximately 70 percent of throughput. Domestic supply within the UAE will continue to be managed by ADNOC. “Working closely with our partners, we will also deliver further efficiencies across our operations and improve asset and business performance,” he added.